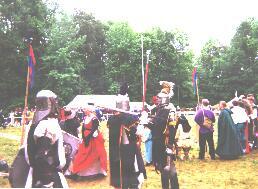 Here are a few pictures taken at the Emerald Joust May 24th-27th 1996. We only had one of those disposable $5 cameras so the picture quality isn't that great. 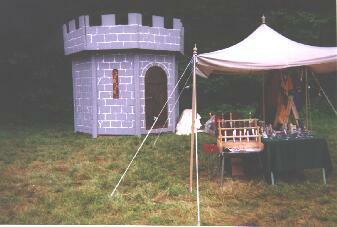 This is our encampment. The foreground is the Tyger Cub pavilion. For information on the things sold by TygerCub hit the TygerCub Homepage. In the background is our Tower. We built it out of PVC, Plywood, and Foam and it fits into the back of a fullsize van. Setup/Takedown time is about 4 hours. Size is a little deceiving, its about 11feet tall when assembled. Its much nicer then a tent to sleep in. This is a picture of the Melee field. This is probably the best picture I took of the overall event, although there are some other pictures that will be on the tygercub Home page pretty soon. I just couldn't resist blowing up this portion of the above picture. If someone can supply me with the names to go with this picture I will gladly give them credit. My one regret for the event is not getting a good picture of the knight with the Frothing Beermug on his helm.